Historically, Star Wars perpetuated the concept that a person’s lineage and “bloodline” was a major factor in a person’s abilities; a concept rooted in racism. Although this was likely not the intent of those who wrote the Star Wars scripts, this concept was always an underlying theme through each trilogy. The Star Wars writers cannot separate themselves from this concept entirely, but The Last Jedi makes a sincere attempt to show that others not born to people with special attributes can achieve great things. The main characters Finn, Rey, and Poe thus far are not portrayed as superheroes propped up by their genetic inheritance, making The Last Jedi the more morally sound iteration of the saga, and therefore better from a capitalist’s perspective. Fortunately, the newest Star Wars saga turns away from this concept to a larger degree than in the past, and yet continues to paint individuality and freedom in a negative light. Still we witness that the most powerful characters in the movie, Kilo Ren and Luke Skywalker both are inheritors of The Forces due to their ancestry and not their desire to cultivate it by their own effort. As with all Star Wars iterations, the movie was enjoyable in many different ways. The Last Jedi has an expansive sense of cinematography that is very visually exciting. There is a lot of adrenaline pumping action. The plot is familiar and most of the familiar characters return, and The Last Jedi introduces several interesting new ones as well. In the same way that the Democrats have tried to change the brand of liberal to progressive, in this movie the Sith Lord changed the brand from the Empire to the First-Order, while keeping all the interstellar oppression and warmongering. Conversely, we see a rebranding of the Jedi movement from the Rebel Alliance to the Resistance (alluding to present day politics possibly?). 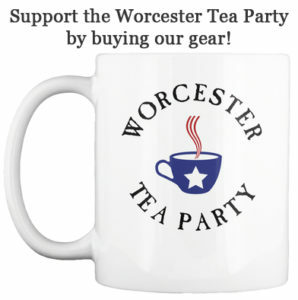 The idea of not choosing sides may not seem to fit with the overall principles of the Tea Party Movement, but any true and honest capitalist must conclude that in modern politics BOTH parties have evil and immoral elements. Therefore, despite DJ’s eventual betrayal of good, the concept of being loyal to one’s values and not a group or team is the foundation of Tea Party principles. 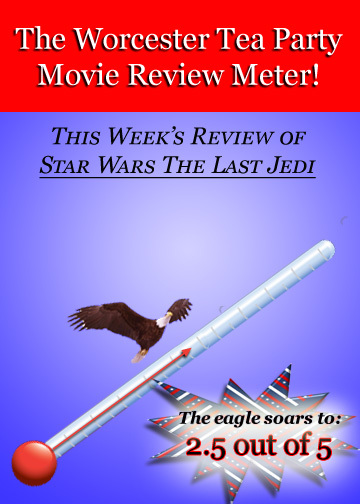 Overall, the Worcester Tea Party sees The Last Jedi as an entertaining movie and truly in the spirit of Star Wars that so many of us anticipate with great eagerness. But in light of how we have matured since our younger years of enjoying Star Wars films, and our witnessing of the true dangers of collectivism and conformity, we cannot give The Last Jedi a very strong Tea Party rating when considered through the spectrum of a capitalist and moral society.